Just when the phones borrowing the design of the XPeria S were starting to be more than they should be, Sony created a different device, at least design wise, and we are presented with the ST21i. 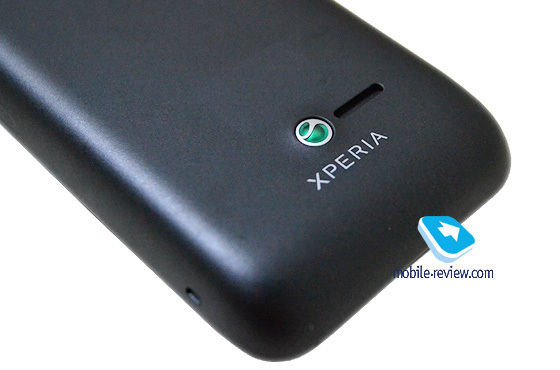 After the appearence of the Xperia S in the market, Sony faced an unusual situation where they had only one new device to offer and an expensive one on top of that. The other three variations of the same concept will hit the market shortly, and the ST21i will follow soon, after a few months. This device is quite different in appearance and size, and targets the lower price range, in a way trying to replace the Xperia mini and Xperia mini pro, even though it is a much inferior device in features, hardware and materials used. Based on a two year old hardware platform, with a cheap small screen of just acceptable performance, yet coming with Ice Cream Sandwich out of the box the ST21i is Sony's logical attempt to atract customers in the lower price range. 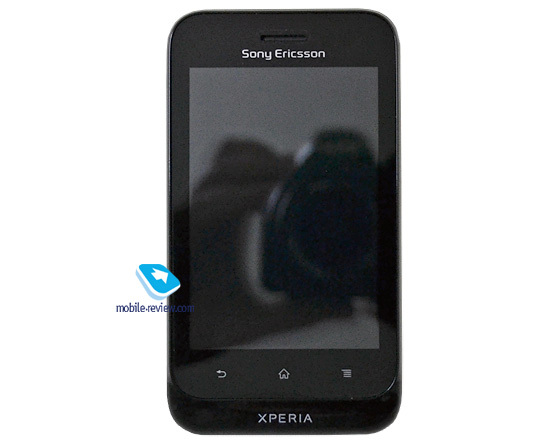 Finally, Sony decided to present us with a phone that doesn't look like another cut-down version of the Xperia S. The design is simple, without any special features, except the small step under the touch sensitive keys below the display. 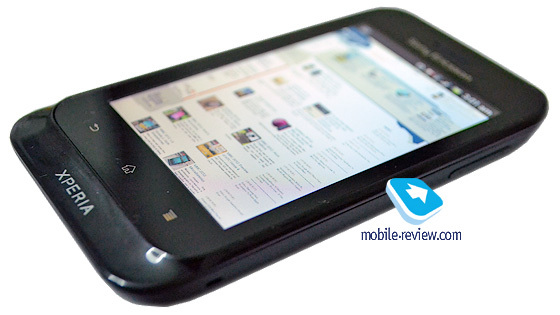 The phone size can be considered small for most people and will definatelly fit in any pocket without any problem. ST21's weight is just right between being too light and leave a cheap feeling, and unreasonably heavy. As for the materials used, the back battery cover is made from a plastic soft in touch and thick enough to leave a quality feel when holding the device. The only thing that gives away the ST21's positioning as a low end device is the touch screen's plastic which is on the cheap side and the screen it self with it's resolution and picture quality. Overall, the phone leaves a much better impression that the Xperia U, for example, even though it will be priced substantially lower. 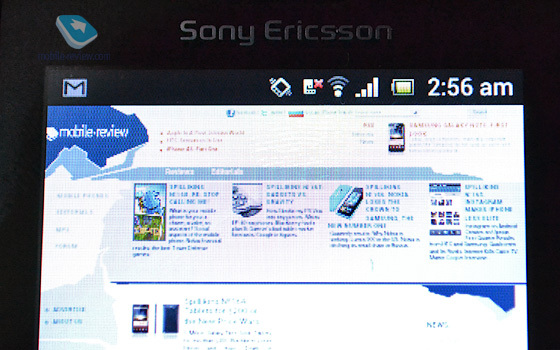 On the front of the device, apart from the Sony Ericsson logo to be changed when the phone hits the market, the screen takes up most of the space. 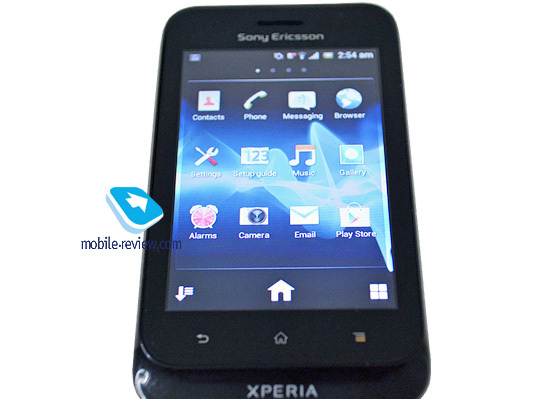 Right under the screen we find the three usual touch sensitive buttons used in all Sony Ericsson and Sony phones so far. 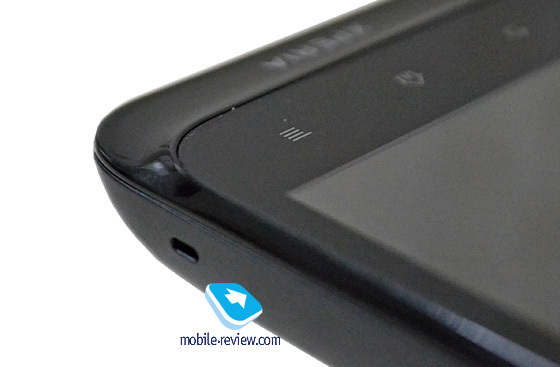 Even though the phone will make it to the market running on Android ICS, Sony decided to leave the physical keys, because the screen's resolution is way to small to be able to accommodate the on-screen buttons. The front side also has the proximity sensor and an ambient light sensor, both of them are well hidden under the black plastic. 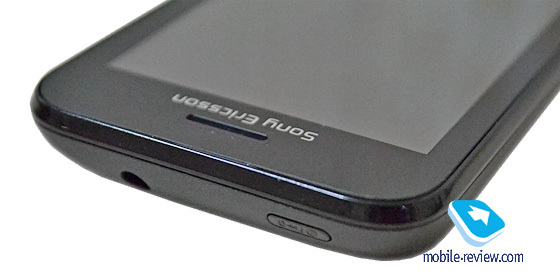 On the left side of the device there is only a microUSB port used for charging and connecting the phone to the computer. On the right side we find the volume keys and a small opening for a wrist band. The Power/Lock key is placed on the top of the ST21i along with a 3.5mm jack for the stereo headphones. 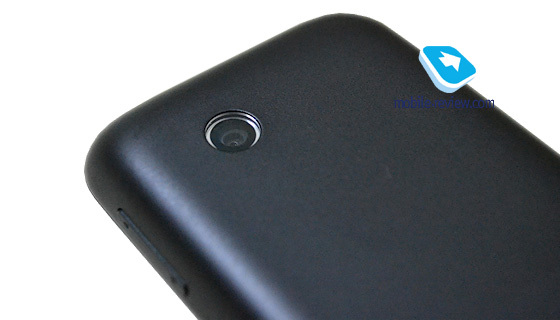 On the bottom there is a small slot used to open the back cover and access a battery and a SIM holder. On the back of the phone there are a 3 MPx camera and a loudspeaker. With the ST21i being a low end device or just above that, there is not much to be expected from the phone's screen and that's exactly what we get. A simple HVGA screen of 320x480 pixels resolution with an acceptable color reproduction that has a blue hue. One note should be made here though: Sony is still making the transition in ICS and so far only some older phones have received the new Android version as an update. On ST21i there is still some work to be done , since the screen's resolution is not used in any of the devices updated so far and some elements of teh UI are drawn incorrectly. As for the responsiveness of the touch layer of the screen it could be better, but is the same in most phones of this category. Although there is an ambient light sensor present on the phone's hardware side , the display lacks an automatic brightness setting. Probably it will be added by the time the ST21i comes to the market. 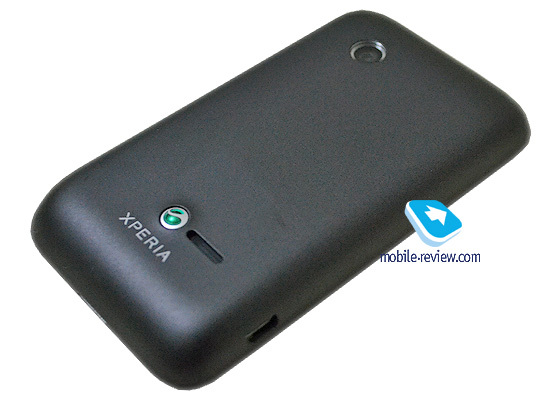 The phone uses a well known BA-700 battery module with a capacity of 1450mAh. Since the ST21i is still in its development, there is no point it measuring the phone's stand-by time. As an educated guess however, based on the hardware used and the phone's screen, there shouldn't be a problem to get around two days of stand-by with average usage. All the usual connectivity options are available. Bluetooth. 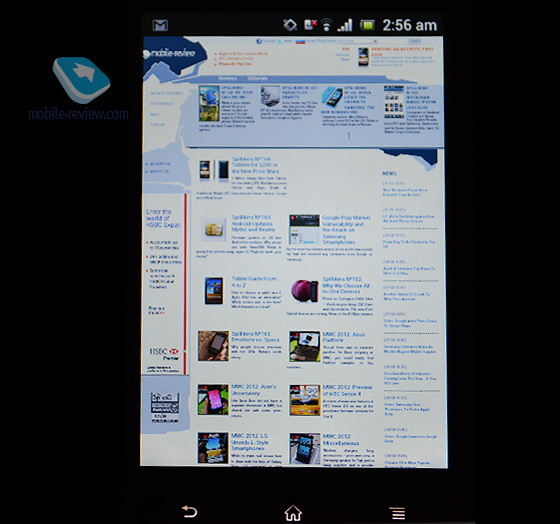 The 2.1 version of bluetooth is supported which is to be expected in a phone of this kind. Stereo music playback is supported along with all the profiles needed for everyday use like Handsfree, Serial Port, Dial Up Networking, File Transfer and Object Push. Wi-Fi. A simple 802.11 b/g module is used with no problems in connection. Average speed is at around 20Mbps and there is an option for a wireless hotspot creation. USB. The microUSB port is used for connecting the phone to a computer and, at least at this point, only the MTP protocol is supported with no option for a mass storage mode. ST21i comes with 512MB of RAM memory and almost 3GBs of onboard storage. Interestignly, unlike most of it's bigger "brothers" the ST21i has a memory card slot available and so the available memory can be expanded further. Qualcomm's MSM7227 is the chipset used in the ST21 with a 800 MHz ARM 11 CPU and the quite old Adreno 200 GPU. This hardware should be enough for running almost all of the phone's pre installed applications. It's only when you try to run some more recent games like Angry Birds Space for example or try to open a heavy web page in the ICS default browser that you realize it's a weak device designed just to be able to run the Android ICS acceptably. The ST21i packs a mediocre 3.0MPx camera lacking autofocus. The picture quality is just acceptable to be used in multimedia messages and social media like Facebook or Twitter, but in no case is good enough to be transfered to the computer to be viewed and archived. There is an option for recording video, but at a maximum of just VGA 640x480 resolution it produces the same poor results as the still camera. The interface of the camera is the same as used in all Sony and Sony Ericsson phones, but with most advanced options missing since they are not supported by the ST21i camera module anyway. ST21i is the first example of Sony's new line up of devices based on Android ICS. However, since the phone is still in it's developement stage there is not much point in describing the OS's features because many things will improve and some may change completely. The only thing of note is that the ICS version of Android seems to run acceptably well in the two year old hardware used in ST21i. With the exception of some "heavy" applications like the phone browser, most applications run smooth enough for easy everyday use. The ST21i has no reception issues and the earphone's volume is good enough for all enviroments. The loudspeaker is quite loud, more than it's needed in some cases, esspecially when set to maximum volume with some sound distortion present. The ST21i comes to play more than one role in Sony's line up. First of all, it's the first phone that breaks away from the design philosophy of the Xperia S. With that said, it's almost like Sony choose to do so because there were more than enough phones based on it so far and probably because they could not produce another device designed the same way, but in an even lower price range than Xperia U.
Secondly, it's Sony's first attempt to capitalize on the fact they are using Asian and mostly Chinese factories to build their devices, where even with higher quality standards used, a lower production cost is still achieved. Even though Chinese companies like ZTE still do not enjoy a respected place in most consumers minds because of the sheer fact they are Chinese, Sony Ericsson and now Sony enjoys that brand advantage, even though they have nothing more to offer to a user than most ZTE and Huawei phones quality wise. Actually many Sony Ericsson phones in the past proved to be more than just of poor built quality both in materials and durability. Since Sony inherited a software department from Sony Ericsson capable of designing better UI optimizations for Android phones that look more sofisticated than the default stock Android used in most Chinese designed phones, they can capitalize on that and sell devices for more money , with the same or even lower production costs. Last, but not least, it's the first Sony phone that will come to the market with Android ICS onboard instead of receiving it with a firmware upgrade a while after the start of sales like Xperia S did , and Xperia P , Xperia U and Xperia Sole will. That is if Sony's developers are able to provide the updates for all these devices by the time the ST21i makes it to the stores, as they are already way above their heads with providing stable Gingerbread releases for those phones, while at the same time providing the ICS upgrades for the phones on the market since the last year. For a phone priced at about €200 at launch, it will probably still be too expensive for most users. For quite less than €200 anyone can get a phone like Samsung's Galaxy Ace, based on the same hardware for the most part, but with a better, bigger screen and quality materials used. Sony is betting on being the first to provide a cheap phone running ICS and is planning to capitalize financially on that trick as much as possible. It remains to be seen if this will come true or if someone else will come up with a same device sooner, or a better one at the same price range at the same time the ST21i is made available to consumers.